Penguins are the most perfect seabirds that have ever lived, as beautifully designed for aquatic life as whales or seals. 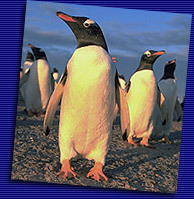 All penguin species share certain traits; stiff flippers instead of wings, tiny, densely packed feathers for insulation, and their unique, upright stance. Yet there is also considerable variety among the seventeen penguin species; the following chart may help you keep them all straight, and tell you something about them. Also, just click on the English name for each bird, you will see a picture and some additional information about that species! The Great Penguins : Aptenodytes - "Flightess Diver"
The Brush-tailed Penguins : Pygoscelis - "Bottom-legged"
The Crested Penguins : Eudyptes - "Good Diver"
The Yellow-Eyed Penguin : Megadyptes - "Large Diver"
The Banded Penguins : Spheniscus - "Wedge-like"
The Little Penguin : Eudyptula - "Little Good Diver"